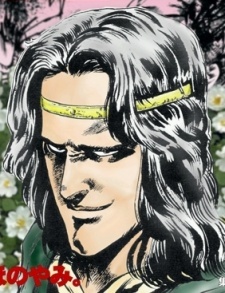 A self-proclaimed genius, Amiba trained in Nanto Suicho Ken under Rofu, but having failed to become successor he turned his attention to Hokuto Shin Ken. When Toki refused to share his knowledge with Amiba, he began experimenting by himself and almost killed an elderly man with his efforts. For this blunder he was scolded by Toki and subsequently swore revenge on both Toki and the Village of Miracles. Amiba later teamed up with Jagi, who helped make Amiba resemble Toki and even scarred his back with a club to recreate Toki's scar. Amiba then learned enough Hokuto Shin Ken techniques from Jagi to successfully impersonate Toki. With the real Toki imprisoned in Cassandra, Amiba tarnished his image and tortured both civilians and martial artists with his experiments. He performed sadistic "new pressure point tests" on living humans and reported his findings to Raoh. He also claimed that he could learn any martial art under short periods. He develops a style imitating Hokuto Shinken, which he names Hokuda Shin Ken (Needle Fist of the North Snake) in Ten no Haoh. Kenshiro finally used Zankai Sekihoken, causing Amiba to involuntarily walk over the edge of a high-rise building.